Heliconias make great garden specimens and are also much sought after by the florist industry as they are most suitable as cut flowers. Heliconias are a tropical plant so cool climate gardeners miss out on such beauties as Heliconia psittacorum, Heliconia rostrata, and the giant Heliconia caribaea. Heleconias may be grown in pots or in the ground, they do have a vigorous root system so consider using a root barrier when planting in the open if this is a concern. A deep moist humus rich soil is best. 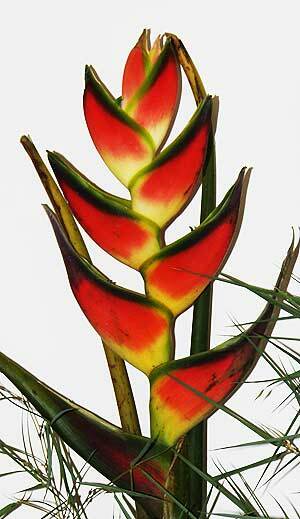 In the tropics plant them just before the wet season commences for best results. They may die back in winter but will flower from summer through autumn. Best suited to Queensland, Sunshine Coast, Gold Coast and further North. Heliconia Schiedeana is perhaps one of the better species for cooler climates, it originally comes from lower mountain regions of South America. Perhaps not as spectacular as some of its relatives, but the red and yellow flowers which appear in early summer are long lasting. At the end of winter these wonders can be cut back hard, removing only the old flowering shoots from the previous season, but not the new ones, ready for a new spurt of growth. This one will still need a frost free position and no cold winds.